Winter hardy to USDA Zones 8-10. Will generally survive temperatures to 18 degrees F with out damage. Best in full sun. Tolerates part shade. Needs regular and consistent moisture to produce best fruits. Easily grown in average, well-drained soils. Best where winters are cool and summers moderate (80-90 degrees F). Summer heat stress may cause premature fruit drop. Best propagated by cuttings or by grafting from known cultivars. Can be pruned to form an interesting hedge. This is a good low-maintenance shrub for hot dry problem areas. For best fruit production, select cultivars of good quality with ability to self-pollinate (some do not self-pollinate). Deeply water on a regular basis. Mulch soil around the shrubs to protect the shallow roots. Easily grown from seed, but cultivars often do not come true from seed. Acca sellowiana, commonly known as pineapple guava, is an evergreen perennial shrub or small tree of the myrtle family that typically matures to 10-15’ tall and as wide, but infrequently will rise to as much as 25’ tall. It is native to the highlands of southern Brazil, eastern Paraguay, Uruguay, northern Argentina and Columbia. It is cultivated as an ornamental for appreciation of its evergreen foliage, flowers and fruit and/or as a fruiting tree/shrub for harvest of its edible fruit. It is occasionally grown in the U.S. from Florida to Texas and California, but fruiting can sometimes be unreliable in these areas. Although fruits are often commercially sold where they are grown, they are rarely exported to other locations because they bruise easily. Evergreen, thick, leathery, short-petioled, egg shaped leaves (to 2-3” long and 1” wide) are bluntly elliptical. 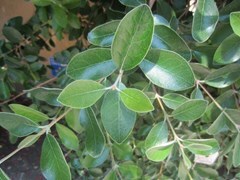 Leaves are soft green above and silvery-green beneath. Flowers (to 1” across) bloom singly or in clusters in spring (May – June). Each flower has fleshy white petals tinged inside with purple and contrasting red stamens tipped with yellow pollen. Flowers are edible and may be added to salads. Flowers are followed by rounded to pear-shaped fruits (1-3” long) which have waxy blue-green or gray-green skins surrounding a greenish, edible, inner pulp. Fruits fall to the ground at maturity and should be promptly gathered and eaten. When fruits begin to ripen, put a tarp under the tree, shake the tree every couple of days and gather the fallen fruit. Ripe fruit has a perfume-like fragrance and a pineapple-spearmint to mint-apple flavor. Ripe fruit may be eaten by slicing the fruit in half or in quarters and scooping out the pulp with a spoon. Tree-ripened fruit is generally better tasting than fruit picked off the shrub and ripened indoors on the kitchen window sill. German botanist Otto Karl Berg (1816-1866) described this plant as Feijoa sellowiana in 1859. In 1941, the genus Feijoa was combined with the genus Acca (Acca domingensis had been originally named in 1856). Genus name comes from a Peruvian name. Specific epithet honors Friedrich Sello (1789-1831) a German botanist who collected plants in South America. Harvest edible fruit. Landscape specimen grown as a hedge, screen or windbreak. Espalier or train as a small tree with one or more trunks.